Born in Ohio, USA, in 1955. 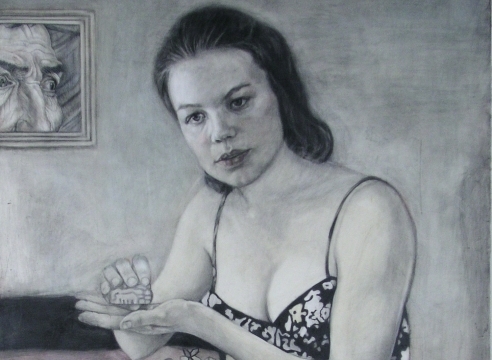 Scobel makes paintings of women and children with a sense of innocence and certain foreboding or darkness. She uses a specific technique in her works: graphite, wax and watercolours on wooden panels. Drawing is the basis of her works. Nevertheless, this atmospheric character, rather than a linear one, turns it into a painterly work. The graphite defining each feature, evaporates due to a wax layer, generously applied all over the surface of the panel. This softens the linear nature of graphite drawing and merges it with the colour, giving an aerial nature to the work. Scobel’s paintings are rooted within the Flemish Primitives and the Cinquecento portrait tradition. She opts for more complex and nuanced three quarters portrait, with a low perspective angle, reminiscent of a cinematographic angle. The paintings are all portraits of women. A display of diverse features and psyches, marked by a profound individuality, each one protecting the mystery in which they are intimately absorbed. What they all share is this disturbing sense of introspection and the feeling that all we are allowed to see is not all there is. She has starred solo exhibitions in Europe and USA, including Unsolved Mysteries in Rockville Center, (New York) and Holde Frauen Sagt: 15 zeitgenssische Kunstlerinnen und das Medium Zeichnung in the Fridericianum Museum (Kasel).